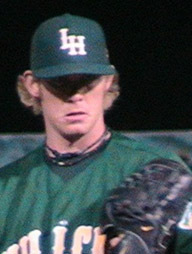 Matt was “Pitcher of the Year” in 2009 for the Lynchburgh (VA) Hillcats. Mickey Truck Bodies is restructuring its Parts Team with an expanded staff and an enhanced, more user-friendly e-commerce web site. The moves are designed to make purchasing parts, used equipment and reconditioning services from Mickey faster and easier all the way from the search and selection process to ordering and shipping. The new web site will be up and running by summer. Matt McSwain has joined the team as a Parts Specialist, reporting to Kyle McLaughlin, Director Reconditioning, Parts & Used Equipment. He joined Mickey in 2013 in the Van Plant and was later promoted to Inventory Control in the warehouse. “Matt’s experience in the van plant and the warehouse give him some unique perspective on how our parts inventory can be best organized to meet all our objectives for customer service,” says Kyle. By all indications Matt is pitching Mickey Genuine Parts as well as he pitched in the farm systems for the Oakland A’s and Pittsburgh Pirates from 2006 to 2012. He was “Pitcher of the Year” in 2009 for the Lynchburgh (VA) Hillcats, a Pittsburgh Pirates affiliate. Matt majored in Sports Marketing at Elon University in North Carolina. Mickey offers a large inventory of stock parts for same-day shipping on all orders received by 2 PM EST, and all fabricated parts are shipped within 1 to 3 working days. In addition to parts for all of its units, the company carries parts for other makes and models. Mickey’s 4 company-owned and –operated Reconditioning & Service Centers handle fleet painting, decal installation, chassis modifications, lift gate installation & repair, body work (major & minor), on-site estimates, safety inspections and trailer parts & repair. All used equipment can be reconditioned according to customer specifications.